I was blessed to find myself back on St. Simons Island for a few days over the Memorial Day weekend. 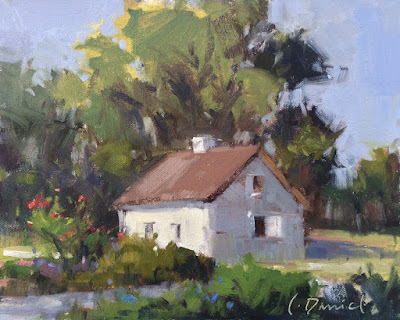 It was a short visit, but I managed to get out painting (how not to?) Little studies were in order and I had to work fast; but I find we have to catch these things when we can!!! 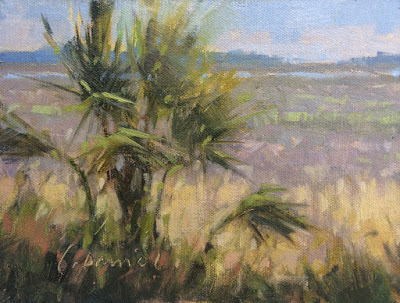 In this piece, I wanted to capture the feeling of those lacy palmetto branches fluttering in the breeze. The soft colors of the marsh created an awesome backdrop, drifting in and out behind the palm fronds. Great name for this piece. It describes in 2 words exactly what you were going for and achieved. Having seen your process, I actually pictured you drawing it on with your darks and building it forward. That was so weird. Love it and glad you got to go. Big Commission - In Situ!